The elaborate Italian gilt metal floral wall decoration has spikes located up the sides and at the top and bottom for holding 14 candles. 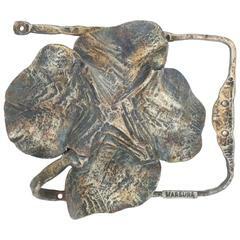 The whole composition is held in place with a silver gilt, rippling metal bow. The centers of the flowers are also silver gilt. Few missing petals here and there. 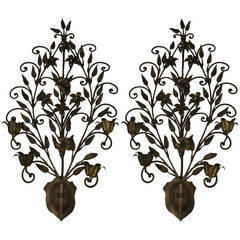 Highly decorative and unusual large pair of Florentine Rococo or Baroque style metal candle sconces for wall decoration. 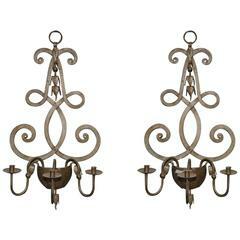 Pair of silver gilt two-arm wall sconces with leaf motif. Height includes candle shaft. Sconce height is 5.5". Gilt Italian hand sconces, Italy, circa 1970s. They have been rewired and are ready to use. The price noted below includes the shades. 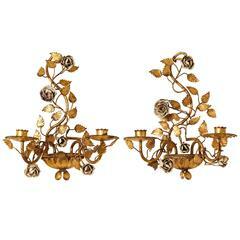 A charming and chic pair of Italian painted floral and gilt metal wall sconces with two candle arms. (Can be electrified if desired).